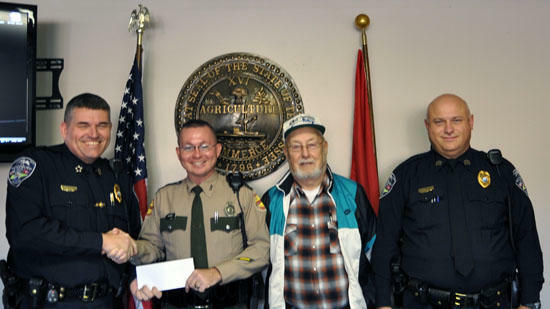 A donation was recently made to the Neighborhood Watch food drive in the amount of $1000 by State Trooper FOP Lodge 44. The Troop selects a county in their area to donate to each year. This money will help feed a lot of families in Cannon County this year. We are grateful for Troop 44’s generosity. Pictured from left to right are Chief Tony Burnett, former Woodbury Police Sgt. and current State Trooper Dewayne Jennings, Neighborhood Watch member Hank Lloyd and Sgt. Lowell Womack.